Qatar Airways wrapped up a highly successful presence at Dubai Air Show last week with orders for 90 aircraft, announcement of seven new destinations and being named Airline of the Year by a leading aviation magazine, which also honored the airline’s CEO for his achievements. Akbar Al Baker was inducted into the Hall of Fame at the annual Aviation Business awards, recognizing his dynamic leadership in steering the aggressive expansion of Qatar Airways since taking charge as chief executive officer in 1997. 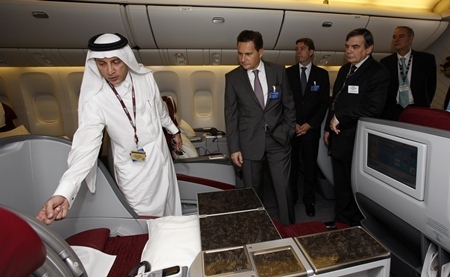 Qatar Airways Chief Executive Officer Akbar Al Baker, left, with French Minister of Industry, Energy and the Digital Economy, Eric Besson, onboard one of the airline’s Boeing 777’s on static display at the Dubai Air Show. The awards evening in Dubai also honored Qatar Airways with the Airline of the Year accolade celebrating the carrier’s focus on service excellence and high standards, spreading its wings to over 100 destinations around the world in just 14 years of operation. The eventful week saw the Doha-based carrier place orders, both firm and option, for 88 of the Airbus A320 Neo narrow body aircraft, as well as two Boeing 777 freighters. Amid the flurry of new announcements last week, Al Baker delivered the keynote address at the Aviation Business Awards in the presence of senior industry executives from across the Middle East, at which he spoke of the region building up a robust niche for itself when it comes to air transport, taking advantage of its geographical position. 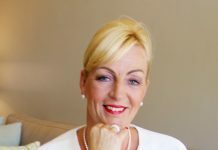 During the Air Show, the carrier announced a raft of new destinations for 2012 – Gassim in the Kingdom of Saudi Arabia; the West Australian city of Perth; Finnish capital Helsinki; Zanzibar; Croatian capital Zagreb; Kigali in Rwanda and Mombasa in Kenya.